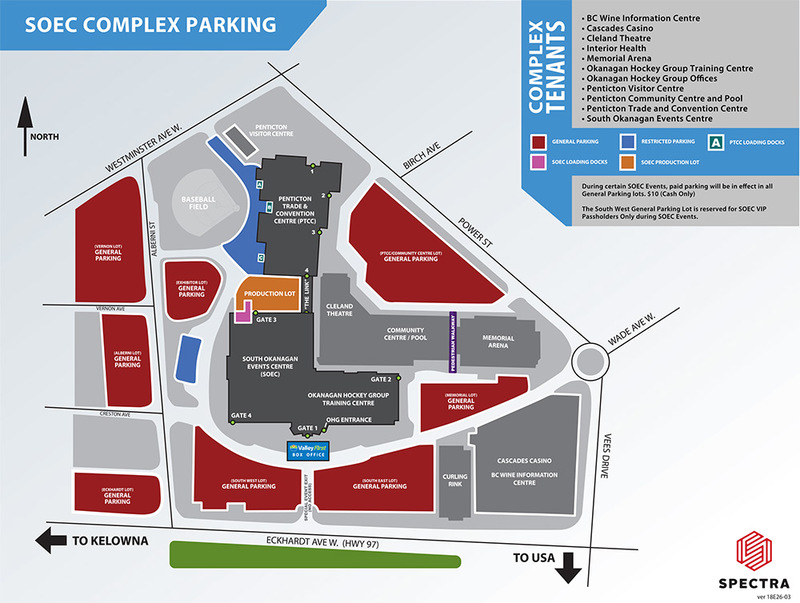 For major events and concerts, the public parking lots at the South Okanagan Events Centre (SOEC) are “Pay and Display” parking. There is no pay parking for Penticton Vees Junior ‘A’ Hockey games. For major events, there is a $10 (cash only) parking fee. Parking attendants are on-site to direct traffic and accept payment. When you Pay and Display park, the revenues benefit projects and improvements within the City of Penticton. From Penticton Regional Airport | Approx. 10 minutes. From Kelowna | Approx. 50 minutes. From Osoyoos/Oliver | Approx. 60 minutes. Get exact directions from your location with help from Google Maps.